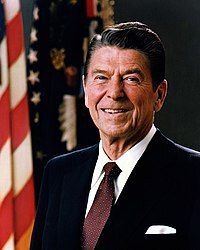 B'é Ronald Wilson Reagan (Gaeilge: Raghnall Mac Liam Ó Ríagáin) (6 Feabhra, 1911 - 5 Meitheamh, 2004) an 40ú hUachtarán na Stát Aontaithe, agus an 33ú Gobharnóir California ó 1967 go dtí 1975. Níos luaithe, bhí roinnt cáil ag Reagan mar chraoltóir agus aisteoir. Ag 69 bliana d'aois, b'é Reagan an duine is sine a ghlac an t-uachtaránacht nuair a thóg sé an post sa bhliain 1981. Fuair sé bás i 2004, tar éis deichniúr le haicíd Alzheimer. Tugadh an leathanach seo cothrom le dáta an 6 Márta 2016 ag 20:10.